YUM!! 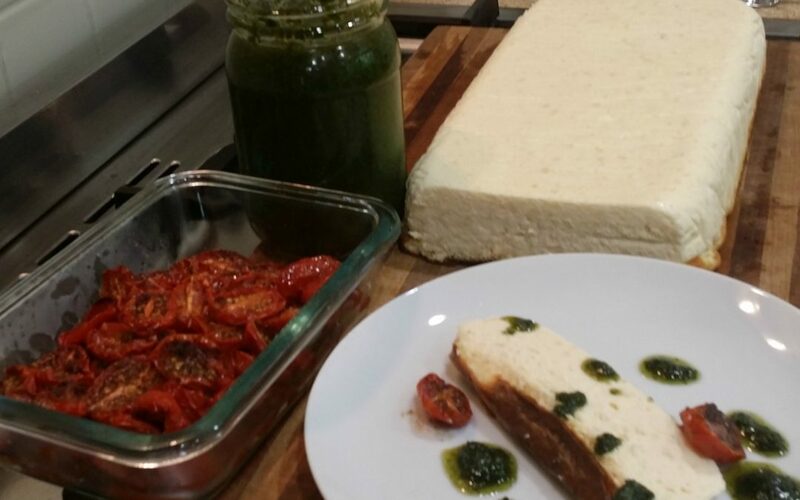 Baked Ricotta with slow roasted sumac tomatoes and Basil oil. Great for a simple lunch or starter. I recently served this dish as a starter for a Christmas dinner. This simple dish was such a hit that I though I would share it with you. So easy to make and the reward is everyone, who can eat dairy, will ask for seconds. 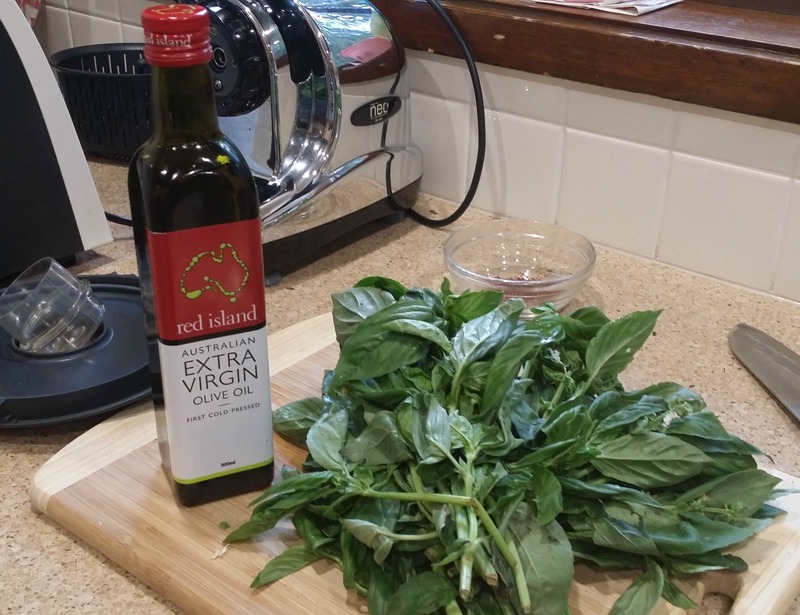 The red is provided by my slow roasted sumac tomatoes and the green is provided by a simple mix of fresh basil and olive oil! Here the recipe. 1. Preheat oven to 180C. Line a loaf tin with baking paper and rub the base and sides with olive oil. 2. Place ricotta in a large bowl and add eggs one at a time, mixing until well combined. 3. Mix in Parmesan and spoon the cheese mixture into the prepared loaf tin. 4. Place loaf tin in a larger baking tray and pour water into the larger tray so that it comes about half way up the sides of the loaf tin. 5. Bake for 45mins – 1hr or until the ricotta is firm and golden brown. Remove from the water bath and allow to cool to room temp in the tin. 6. Run a knife around the edge of the tin to loosen and then invert onto a serving platter. 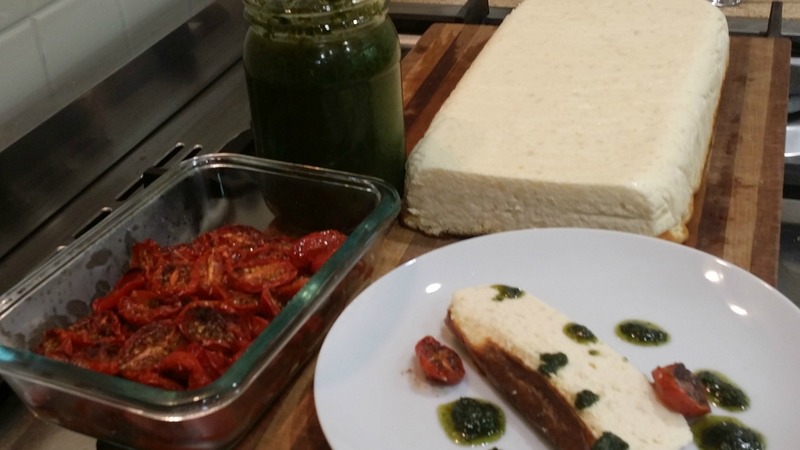 Drizzle with basil oil and top with tomatoes. Preheat your oven to 150C if you have time or 200C if you’re in a rush. Place tomato halves cut side up on a baking tray lined with baking paper. 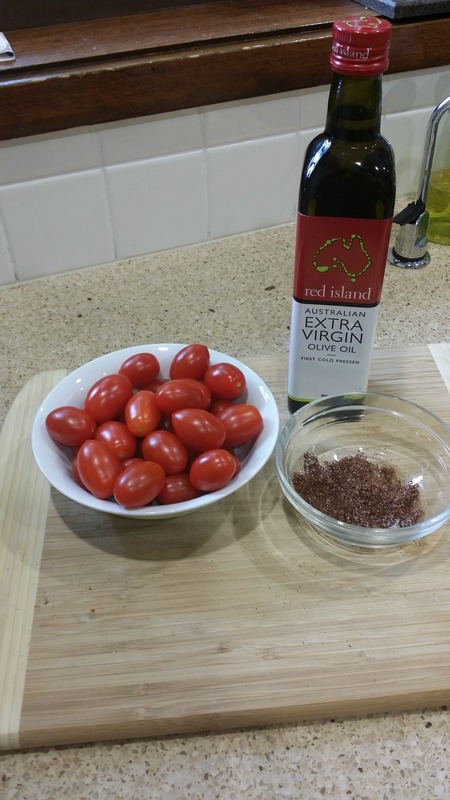 Combine salt and sumac with a little black pepper and scatter over the tomatoes. Bake for 1 1/2 – 2hrs if using the slow method or 30 – 50 minutes if fast tracking. Blend leaves in a food processor until well chopped.